A pleasure to grow, start to finish. Started putting on the frost early and just built from there. A little finicky with nutes in the flowering stage but nothing dramatic. Harvested her over days 70 - 72. 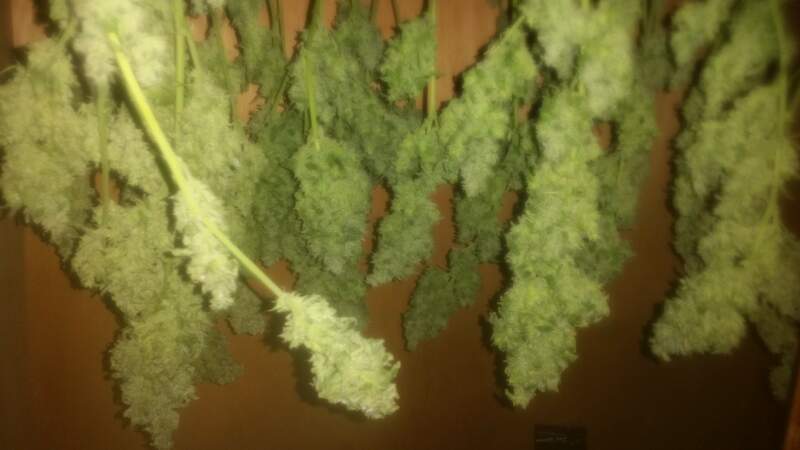 She dried over 5 days - humidity was around 85% so I hung the buds in a cupboard with the door open, and pointed the de-humidifier at the cupboard door. So it had indirect air-flow, and the cupboard was around 60% RH. Not perfect but seemed to work! Curing currently with Boveda 62%. I'll update the smoke report when I'm not taking codeine for a broken ankle, and once the cure is done. So far I'm impressed! Uplifting head stone then a knockout sedative hit. I made a batch of cannabutter from the trim and baked some brownies. Holy crapballs. I had a small brownie and was munted for hours. Reminded me of the space cakes I had last Amsterdam trip, except this time I didn't pass out on a pub table at 3 in the afternoon. Another thumbs up for the LSD! The plants seem to love the OziMagic. Really gives them a boost in the flowering stage. I'm excited for your update of smoke report. Excellent diary. İs it good for pain relief? By the way how is your ankle now? @Tonks, That is my dilemma ! I have been Perm. Disabled since 1996 and in Pain 24/7/365. I live on a diet of Morphine & Oxycodone. I am still searching for that one strain which will relieve the Pain but, not put me in to couch-lock the whole time. I get enough of that from the Morphine ! FYI, the Nerve damage is permanent and life-long so, being 60 I have many more years of a pain-filled life to go. (maybe) I have tried high CBD strains as well as the Oil and it does nothing for me. I did cannabutter from my first grow its white widow from dinafem . I visited to Amaterdam last year. And ı ate some space cake like brownie. İts not strong too much. When ı ate my homemade brownie its poisonuss. Oh my god. I checked youtube stoners for prepare a good pot brownie. But it was very strong. Now white lsd auto is scared me. I will prepare half strenght. Good job Tonks. Just two weeks my harvest. I touched the bud and all day my fingers smell lime and mint. @Tonks I'm assuming you are no longer posting but, I just have to ask. Your last entry said you got 4.5 oz Wet & only 1.5 oz. Dry but, you show Five Jars of LSD. Do those jars only hold a 1/4 oz each? I'm only asking because of anticipating my final tally at the end of my grow. I got 4.5oz dry off this girl, I never do wet weights cause I dry them on the branches. The jars are a little under an ounce each cause this girl was pretty airy. Yeah I didn't take any good close-ups that week, was my second grow and first diary so I had no idea what I was doing lol! Every auto I've done so far you start seeing the white hairs coming out of the pistils around week 4. I'd start introducing flowering nutes week 5 if you haven't already, just go gradually, but everyone has their own schedule they prefer for autos lol so I'm sure others would disagree. @Tonks, hello, thanks for clearing that up about final weight. I was curious as to how much I would get from an auto. This is my first time too. The lighting info, when I was filling out the info I didn't see anywhere to say 20 hour/4 hours. I am using a 20 hour On schedule. I was just informed that I might be applying too much nutes, mainly the Grow Big nitrogen. I am going to just water for the next week, then begin applying the flowering nutes slowly. I am used to growing Pure Sativa's which take around six months to mature. That is why I am giving these auto's a try. Hopefully week five will show some improvements. I staked my branches outward, using some dried Sativa stems bent in to a V like a tent stake. As the plant grows, the branches can pull the stake up as she grows. You can see this technique in the next set of photo's. Again, thanks for the info.